Good morning beautiful ♥ It's a gorgeous sunny day here in New York! Just about to start getting ready to film and going through some of the comments from the video I posted yesterday which I did with Skeena. You guys are amazing :) I'm happy you liked it and that you got to see a different side of me than you're probably used to :) We had a lot of fun filming it. Beautiful pictures Annie! I don't have instagram but I love following you on twitter. I love the pictures u post on instagram! And really liked the sisters video u did. You guys look like twinnies, and remind me of me and my sister. So fun to watch! You should def come to Amsterdam someday! I loved your videos with Skeena, and these pictures posts!! @melanibrielle :) Love all your videos! Glad you're on Instagram more! I only go on there nowadays for my social media fix. :) I love the pics and your videos so much and have used a few of the recipes and tips you have given. All seem beneficial so far! Sidenote: What do you use to film your videos? The clarity is fabulous! Love all your pics! x. Love the pictures... especially of the food. Good inspiration to be healthy! All the healthy food pics are definitively inspiration. You're so pretty and inspirational! anitika_94 would mean the world if you followed me! Oh, I love instagram too! Here's my username: juldesmet! Besides that I really wanted to tell you how much I enjoy your blog & youtubevideos! You really inspire me in so many ways. Thanks for that! Very colorful pics annie! loved them!! I followed you on instagram and twitter for some time now, and I'm glad you're posting more often! When are you sending out the perfumes to the winners? I didn't get a reply to my email :) Hope it's soon! I know you've been busy traveling. Please let us know in one of your posts! You are such an inspiration Annie! I enjoy watching your videos and reading your blog posts very much! This world needs more wonderful women like you:)My Instagram username is oligirl101. I would mean the world if you followed me! I only just started my instagram today :) But can already tell I am going to love it. Look out for my juicing recipes! You should definitely do more videos with your friends and family. Its nice to see a different side of you. Of course love them both. everything you do just looks like perfection. it is so exemplary for a lot of people including me. Hi Annie ! I love your instagram and my username is AL_HAILIE . 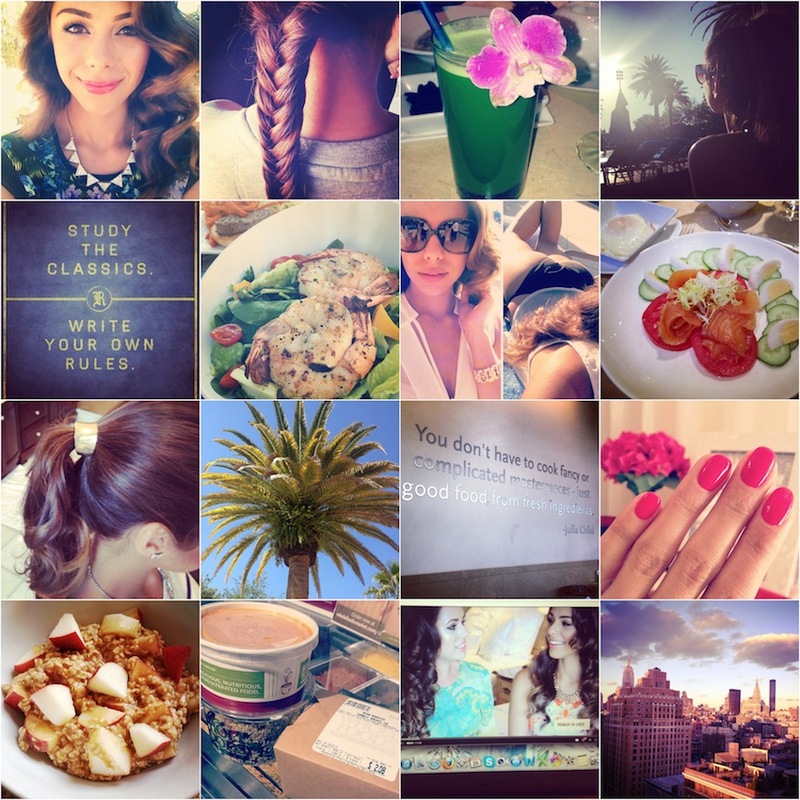 My Username on instagram is: itsalexandraa :) please follow me!! :) :** love you!! Love the fact that we can see another side of you, it's like you are closer to me !! Finally, it's my favorite video of you!!!! Hope you are well, can't wait to your next video !!! I have this strange feeling... I really consider you as a great friend now, and sometimes I feel bad or anything, I just watch your videos, they bring me a good energy !!! anyway... thank you, thank youuuu !! :) Really appreciate U ! have a nice day !! My Instagram-username is MissGraceKelly87. I'm so excited that you post more pictures in there!!! I'm a big Fan of your health posts, they're so inspiring!!! You're energy is so great and I love to watch your videos!!! Such a beautiful lady inside and out. Yes I think it was really fun to see you in à diffrent way. You seem like à very nice person to hang with and so inspiring! Been following you for about à half year now and i've learned soo much by watching your videos, so thank you so much! You inspired me start my healthy lifestyle and i feel great about it! Hi Annie! I loved the video with Skeena too! and I think it's awesome that you support each other's blogs and YT channels :) When you were on holiday with your family and weren't blogging for a long time (after you went skiing) I went to Skeena's IG and said "Is Annie okay?" and she replied to let me know you were alive, lol :) it's very sweet you two are so close. I always wanted a sister my age and sadly I don't have one (my sisters are 15 years older and very different from me) but I do have some very good friends. Thank you for continuously being an inspiration to so many young women, reminding us to have confidence and to glow from within. I am going to read that book "Fabulosity" you mentioned because a lot of times I feel like I should be modest, not forthcoming about my appearance, but as you mentioned if it makes you feel your best why hide it? So thank you. Have a wonderful day! I already follow you on instagram and I ADORE the pictures you post. annie i love your videos sooo much,you're so inspiring to me and i think you're beautiful! I wish I can meet you one day. We have so much in common. Any who, I hope your day has been AMAZING!! Love Love Love your blog and your channel! You are such an inspirational person. I love reading your blog and love watching your videos!! HI love ur vids on youtube!! it would be awesome if you follow me back...oh nd ur pics are amazing. looking forward to more of ur vids and pictures. Started being more healthy and now Im juicing aswell thanks to you wiii! Hey Annie, love your instagram pictures. A huge fan! Just wondering if you are going to follow us back if we leave our username? love you annie and your mentality! Amazing photos, love all of them..! Deine Bilder sind wunderschön. Mit Instagram kann man richtig gute Bilder machen bzw. bearbeiten. Just found your blog and I'm loving it :) So many great tutorials! My username is mad_pol, see you in the instagram world! Love from India! You are so pretty inside as well as outside. Love your values. The most motivational artcle I ever read in my life is your blog article - "From Me, To Me"